authentic movement & aesthetic inspiration from Asia, North Africa, and Europe. On Sunday, July 5th, Saffron Dance will present the first full-length production by its international touring company, Wild Saffron. “Bringing such a diverse project to life is not a small undertaking,” says Saphira, a former attorney and Georgetown Law alumna. “We are so thankful to work with Wild Saffron Artistic Director, Moria Chappell. 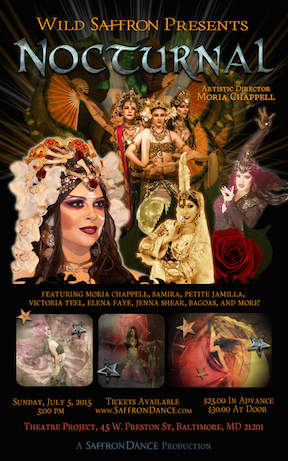 Her unique skill set made her the perfect choice to captain this project.” Known as the “belly dancing anthropologist,” Moria Chappell was the Artistic Director of the international touring professional dance company, The Bellydance Superstars, led by music producer mogul, Miles Copeland, who managed by STING & POLICE for more than 20 years. Ms. Chappell has spent the last two decades traveling the world to study and research the dances of South and East Asia, and recently relocated to the Washington, DC metropolitan area to join Saffron Dance’s faculty. Other notable choreographies include pieces by Shakira’s teacher and choreographer, Bozenka and Samira Sitara, daughter and protege of Malika Kalantarova, who was named “People’s Artist of Tajikistan” in 1976 and “Honored Artist of Tajikistan” in 1972. Price: $25 in advance and $30 day-of. All tickets delivered at will call on the evening of the show. Saffron Dance is your belly dance destination in the Washington, DC metropolitan area! shows and weekly classes in Arlington, VA.